According to the IAB, revenue from Interenet advertising hit an all-time high of $11.6 billion in Q1 2014. With the continued rise of spend on Internet advertising, it is no surprise that companies continue to roll out new features and tools to help marketers analyze the performance of their ads. 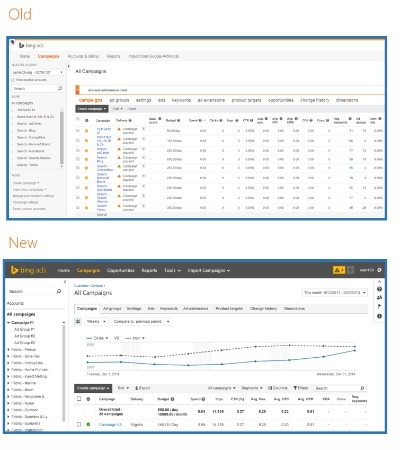 To assist marketers in this never ending quest Bing has recently announced a redesign of their Ads user interface (UI) as well as added and updated a number of features. Perhaps the most interesting change to Bing Ads is the redesign of the UI. While the old design was very methodical with a lot of useful data it was visually dull and there was no image or graph to help marketers visualize the data. Now, not only has the data portion of the UI been redesigned but Microsoft also added a graph at the top which allows users to easily visualize the performance of their ads. Other notable updates includes auto-tagging which allows Bing Ads to automatically tag destination URLs for ads and a new performance indicator called Top Mover which is a diagnostic tool that rapidly analyzes ad performance. Also, the popular search engine has created a new online insertion order feature which allows users to purchase ad space through Bing Ads or Bing Ads API as well as manage and track their budgets and payments.